I celebrated my last Father’s Day with my dad almost 20 years ago. At the time, cancer was sucking the life out of him. He looked more like a passing shadow than the man who had raised me. We are schooled by our dads. Somethings are taught by outright instruction, and somethings are caught as our tiny feet follow in the shade of daddy’s broad shoulders. I think the things we “catch” impact us the most. Sure, I can paint a room or build a shed (yes, I can! ), but how I saw my dad deal with pain, family, love, or obstacles has left a far deeper impression. 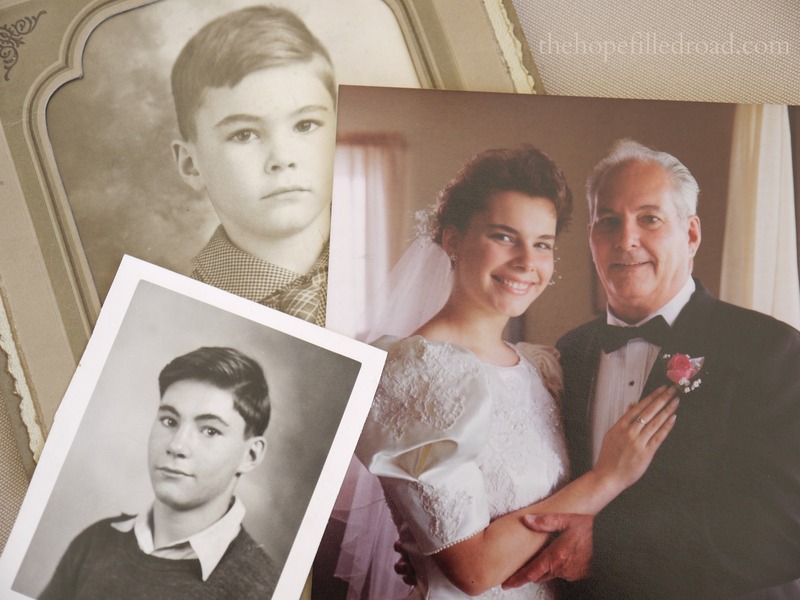 As I remember my dad this week, I wanted to share with you some lessons I “caught” from him. 1. An isolated life is a lonely life. When he was sick, no one came to visit. He had no friends to bear his pain or fears. Friendships were rarely cultivated, and the friendships he did have, dwindled as the years wore on when, oddly, there was more time to tend to them. I wonder if he felt he didn’t deserve friends. As if isolation was a “just reward” for who he thought he was, or how he thought he lived. We are meant to live in community. To share struggle and joy with one another. It’s the “one anothers” that make this life bearable and doable. My dad managed to passed away in the gray hours of an August morning without even his daughters by his side. A final testament to his private, and in my mind – lonely life. My love for words came from my father. He loved crossword puzzles – the harder, the better. “I don’t know, Dad.” I’d reply. “Then go find it.” And off I’d go to search the dictionary or thesaurus for an answer (by the way, it’s enigma). Though he loved words, he never wasted them. Like his life, words were held private until given the proper opportunity or invitation. Now that I’m older, I understand the importance of measuring my words. It’s taken me decades to learn that, sometimes, silence is more powerful. I don’t always agree with what you say, but I will fight to my death your right to say them. Now that you have shown you can achieve goals, there’s nothing you cannot accomplish. Never once – ever – did he say them. 3. Love is in the small things. My dad’s love language was service. He always fixed. He fixed dinner for my mom, sisters, and me every night before he left to work the evening shift. He fixed, he painted, and he built. He rarely sat idle. He even fixed my Barbie doll when I ripped her leg off. He put a big ol’ nut and bolt in her hip. I couldn’t get dresses on her anymore, but hey, she was fixed. For him, it was never about grand gestures. One hundred small, steady acts mattered more than big deeds done on rare occasions. 4. Tell people what you need. If you could read minds, you were the perfect person to work with my dad. Each time my mother was pregnant, the obstetrician promised my parents sons. Each time he was wrong. What’s a fixer to do with a house full of girls? Well … recruit the tough, mouthy one to be your partner. That was me. And the fact my dad never told me what tool he needed, or how long the rows of beans and squash were supposed to be, or where to drill a hole – drove me crazy. Trying to make people guess what’s inside your head just leads to disappointed expectations, frustration, bitterness, and down right anger. Tell people what you need. Be clear. People can’t help you flourish if you don’t speak your need. If you don’t, you’ll end up like dad and me; screaming at each other over a circular saw in the middle of the backyard. Zero fun. 5. Sometimes the weed whacker does belong in the tree. Sometimes you can’t fix what’s not working. In my dad’s case, it was usually the yard equipment. Having never learned the virtue of patience, my dad would often throw our weed whacker up a tree. Once he tried to throw the lawn mower, but it proved a tad too heavy. My mother would stand at the front door and yell “Raymond!” as he picked up the misbehaving contraption and wound up for the swing. Sometimes he would listen and put it down, but most times he’d let it sail into the big oak tree in the front yard. I think the lesson is to let go of the things that most frustrate you – for a time. Give yourself a time-out, cool off, and regroup. Then climb the tree, drag it down, and work again. I miss my dad. He was far from perfect, but he was the one God gave me, and for that – I’m grateful. Happy Father’s Day, Dad. I hope you’re in Heaven tinkering away, and maybe one day I’ll hear you say, “I love you”. My Dad was like that. Even though he never said I Love You, I always knew he did. I really enjoyed this, thank-you. Thank-you also for all the other ones I read and never made comments on. You might want to let people know that they have to click right on the word to be able to type. God bless you and continue to gift you in this way. Thank you, Lynda, for your kind words! It’s wonderful to hear from you.